Hi there! What's happening with Blogger and spacing and justification lately? So fussterating! But anyway, here you are! You've whooshed through another week like a blur on a thistle! I'm pleased to be here today all dressed in green and white as a Guest Designer for the December STAMPlorations Challenge which is "Stamps & A Holiday!" Given that it is a month of holidays, we should see boodles of inspiration in the gallery! Because I have so many holiday cards to make, they tend to be QACAS (quick and clean and simple). Okay, even when I don't have a lot of holiday cards to make, my cards tend to be QACAS! For this card, I went back in time. Years ago, I purchased these full-size note cards that are (were) made of glossy paper with a beautiful forest green marbling pattern on the front and back. 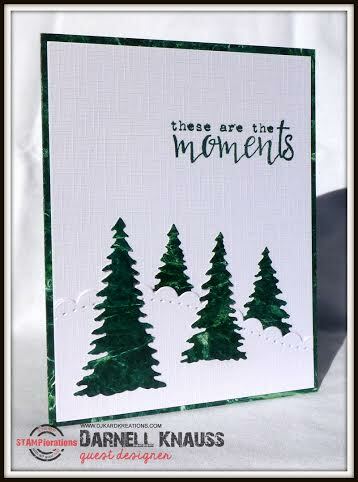 Fast-forward to the modern time of dies and I thought that the card paper would make terrific die-cut evergreen trees. Just to be diff'ernt, I made my snowbank a scalloped one, using a Spellbinder's die. The "Evergreen Trees" die is from Memory Box. The sediment is from Shery's own STAMPlorations set called "Noteworthy." Thank you, Shery, for picking my card as the winner last September so I could enjoy the prize of Guest Designing for this challenge! 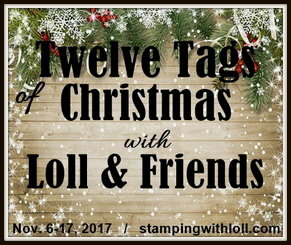 I hope all of you will join in and link up your holiday cards in the STAMPlorations December Challenge! This die is called "Christmas Tree Words" from Die-Versions. This sediment is also from the same MFT stamp set, heat-embossed in white. That white swirl was spose to be a snow hill, but when I was playing around with it, I loved the look of having it schwoop down from the corner. I always wanted hair that schwupt like that. Once again, same beautiful stamp, this time heat-embossed in black. The corner die is part of a four-die NBUS set from Memory Box called "Distressed Holiday Collage." I first saw them used on a fall card made by my friend Sheri and I had to go and immediately order the set. She has a remarkable jewel-colored background behind her die, which I hope to CASE in the future. Pixie's Snippets Playground: Use your snippets. Any of my cards would work today! Be careful where you step in the Playground right now as there are scattered nails about and scaffolding overhead because the stage is being built for the Nativity play! FABbylicious set of makes today. I have the Stamplorations sediment set too!!! 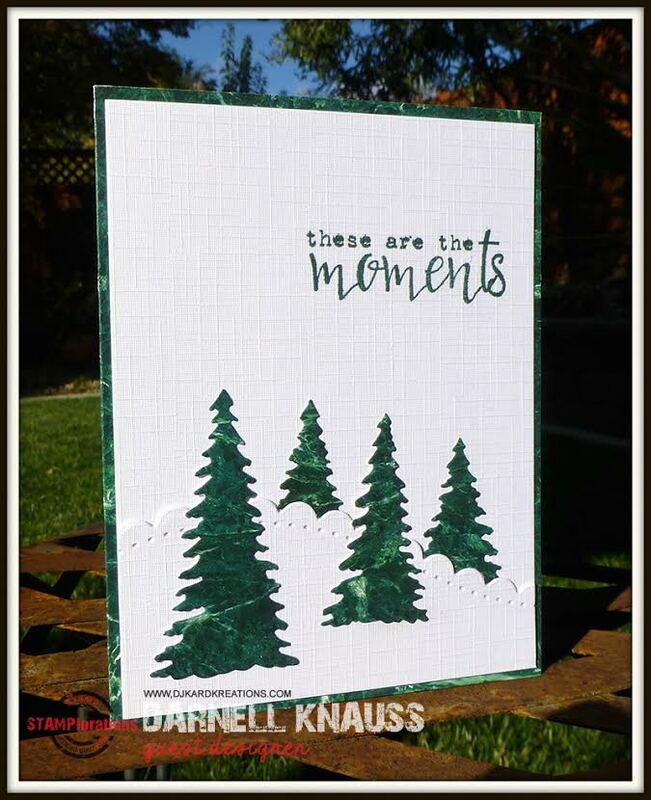 Great use of your stash Darnell, love the marbled green card for the trees. I too have had weird formatting on some Blogger sites but yours loaded up fine! I was looking at my pathetically small stack of Christmas cards and wishing I had a brain that could create gorgeous QACAS cards like you. 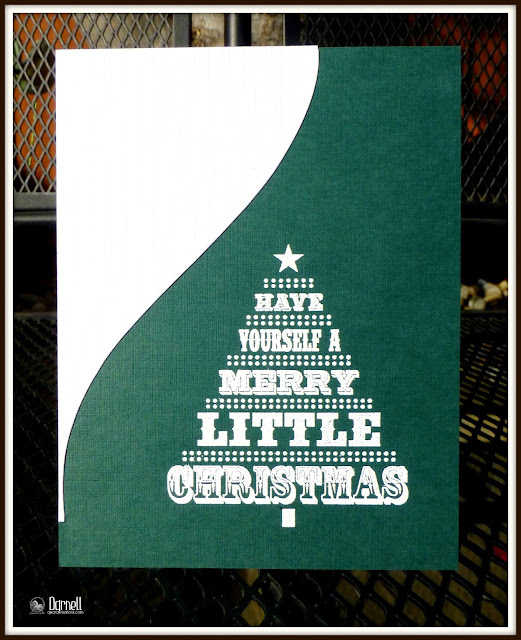 Sigh* You sure know how to rock those emerald tones and I love the scalloped "hill" in the first card! We're so honored when you come to guest with us at STAMPlorations! Wow Darnell, all of these cards are fantastic. Love the QCAS cards you create. Just Beautiful. Love your green and white Holiday cards dear Darnell! Have a great weekend......we are getting some showers here this morning. Love the cards. The last one is my favourite. Great green and white combination on your cards today, dear Darnell. :-) Like them all, but especially the first one with great use of "old" paper for background. They're all beautiful and so Christmas-y! Love the marble looking paper you used on the trees on that first card too. You've been going for the green, so to speak. Getting use out of those notecards...with great success. Adore this deep green and white vibe. Very festive and each card is stunning. Love the contrast and the sentiments. Wow, what fabulous cards Darnell! LOVE the green and white and the designs are gorgeous - each one is a stunner. I kept scrolling further and further down saying to myself 'This is my favourite, oh, this is my favourite' - turns out I love them all equally! I have no idea what's going on in the Playground, it came back again and am now stuck in bed - can't even hop as far as the window. But, there's a lot of squealing and hammering going on so my guess is that you're spot on with the stage being erected :) Little scallywags! Fabulous green and white card collection Darnell, I love them all. 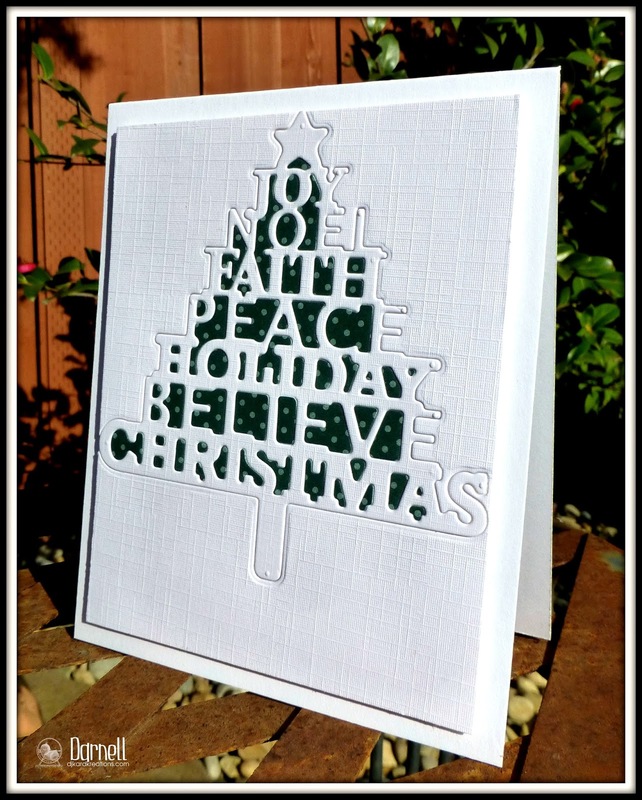 The lovely MFT sentiment tree looks great with your beautifully sharp and clean white embossing. That green is so pretty! Classic, even. I love all of these cards! Your card is so beautiful. I love the mottled tree and the same frame. Beautifully composed card. Wonderful set of cards and that is a fabulous green for Christmas. I love tree cards! Your set is awesome, and I especially like the one for The Paper Players! Thanks for playing along this week Darnell, always fun to see your cards in the gallery! Fab green and white cards Darnell, I love trees on Xmas cards! All are so very beautiful and I love that color of green and the white together. Very festive looking too! Fabulous marble paper Darnell - perfect for the trees! Terrific batch of holiday cards, thanks for the inspiration! Green and white never looked so good together as in this fabulous collection of cards! I especially like the scalloped hillside - very innovative and creative my friend! Well, they are all an absolute Joy to behold. As a duck, I can appreciate all things QUACAS......could certainly do with making a few of these myself. Goodness you have been a busy little stamper, Darnell! I love all your QACAS creations. The rich green color is gorgeous. 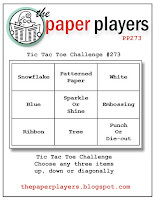 Thanks so much for playing along with my Tic Tac Toe challenge at The Paper Players, and Happy Holidays to you, my friend! Well, aren't you the queen of challenges, today!! Lovely set of cards (my fave is the first one and the last one) and congrats on the GD gig!! Your cards look beautiful, Darnell! I love that deep color of green. Fabulous fourfer. Great use of the green cardstock. Wow that is a lot of cards - way to go. The marbled paper is lovely. Congrats on being Guest Designer. I hope you and Hammy have planted some new conifers in the back yard to replace all the ones used on these ere cards. Very nice they all are too. Hugs Mrs A.
Tree-mendous projects pal (I'm likely not the first one to say that!). The paper on your first card is divine! I love your 'scalloped edge' snowbank - so clever and so cute! Nice touch with more trees on the inside of the card! You KNOW that I will love the polkie dot word tree - so sweet! The snow hill turned swoosh is awesome - great idea! 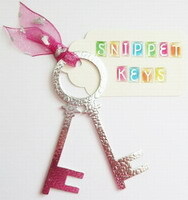 PERFECTLY embossed sentiment! The diagonal graphic beauty is just that...beautifully graphic, clean & simple...love it! I love all your tree cards, Darnell. You certainly know how to take a theme and run, nay gallop, with it! Congrats on your GD spot! That marbled paper makes beautiful pine trees! What a wonderful series of green and white cards! Yes, it is quiet on my blog! I am so behind with everything this year and the panic is starting to set in! Haven't even finished my Christmas cards (which are all the same so I can't share them) and totally missed my own deadline which was Thanksgiving... I'll be back blogging eventually, hopefully soon! A fabulous collection of Christmas cards Darnell!! Love the polka dot tree. Congrats on guesting, your rocked it!! Such a fabulous forest collection Darnell. Love that marbling on the first trees and each card got more fun. These look great.....fab take on trees, real and otherwise.....love the heat embossed idea!!! Wow wow wow!! These are all gorgeous! LOVING that GREEN!!!!!!!!!!!!!!!!!!! Beautiful work, as always, Darnell! Love the diversity of your designs! 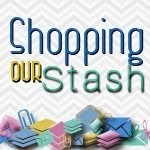 Thanks for sharing with us at Shopping Our Stash! Oops thanks for playing along with Stamp Ink Paper, too! 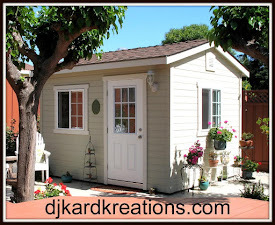 Wow, you've got the workshop humming! You have definitely inspired my mind, now if my hands will get into the act. I need more beautiful FLAT cards like these! Wonderful cards Darnell - puts me in mind of the hills around here - all covered in trees - but thankfully no snow. It is summer here and snow would be most unwelcome! What a forest of beautiful Christmas trees, my friend! I really, really love that last one! Well, haven't you been busy!! So many gorgeous cards in the same beautiful shade of green and white, there will be many happy recipients of these beauties!!! And congrats on your GD spot too! Just adorable....love all your festive trees and so many wonderful Christmas cards. Great to see so many inspiration all in green-white! Love your makes, the first is my favo! Congrats on being a GDT again and with the great STAMPlorations! Hope you enjoy the weekend! We had "Sinterklaas-eve" yesterday and today we are putting up the tree and the christmasdecorations; a fun family day! I almost missed these!! What an array of beautiful cards!! What absolutely beautiful cards! Love those clean and simple designs! Love the simple color combo.... your trees really POP!! 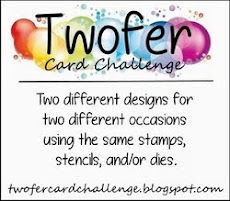 Thanks for submitting a card to our Stamp, Ink, Paper challenge!!! What gorgeous cards Darnell! Those pine trees are just awesome and I love how you used them on the inside as well! 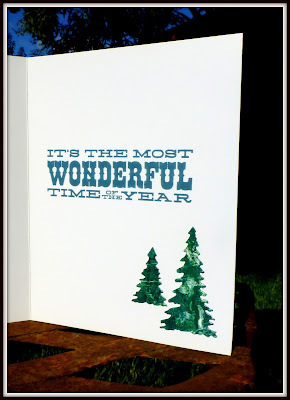 Thanks so much for joining us at Stamp Ink Paper for our cardmaker's choice challenge this week! Those green marbled cards came in mighty handy, Darnell. Both cards you made with them look wonderful. 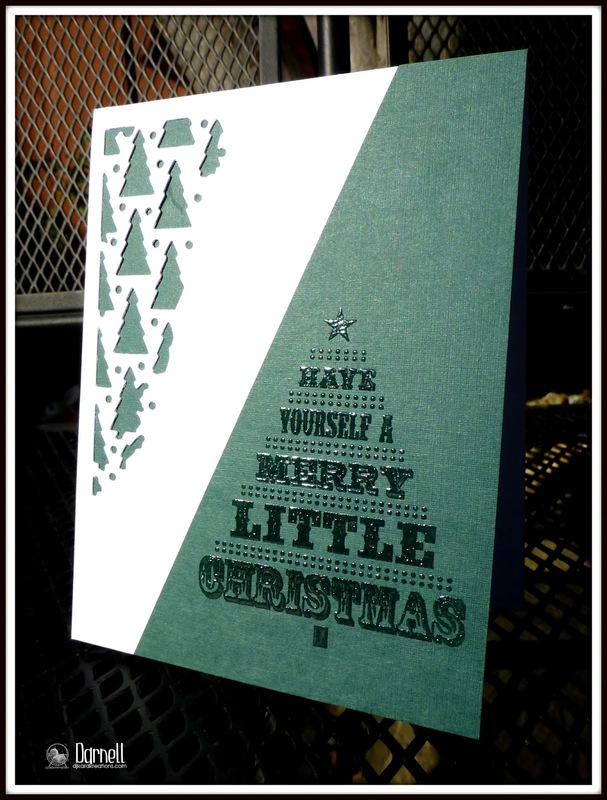 And that tree sentiment stamp, or sentiment tree stamp, is terrific with the dark green paper, and your schwupt. Ohhhh, Love your pretty green marble glossy trees, Darnell! The note cards are a perfect match for that die! 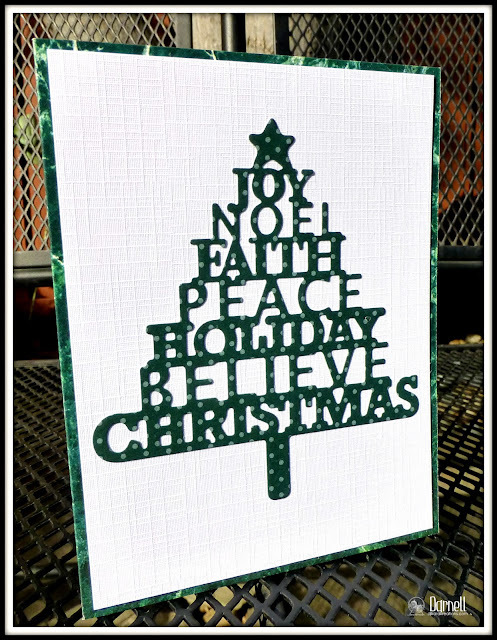 The Christmas Tree Words is beautiful~really like all three of those cards too. Congrats on GD for Stamplorations, Darnell! Great idea to use the notecards for those gorgeous trees! I have the MFT set, but have hardly ever used that tree. You've inspired me! Congratulations on GD for Stamplorations dear Darnell! what can I say about your cards... I love your style so much! you are so inspiring! I can't pick a favourite! Beautiful holiday cards. Thank you so much for participating in the Memory Box season's greetings challenge.